Payne turns and smiles up at the five-foot dame on the wall—a Rembrandt replica—as she smugly grins from her home above the soiled clothing bin. She spies on her neighbors across the shop walls, as Payne tells us the history of the artwork and oddities he’s curated. A denimed docent, Payne walks the clean lines of the racks of clean pants which could seemingly be envisioned as an obscure, new-age installation in a museum celebrating modernity. “It’s all a work in progress,” he says, as we walk past the stoic sarcophagus, a bouncer of sorts, holding firm at the drive-through window. We push through the thick curtains of velvety steam, drawn in by the musical, mechanical din that clicks and swishes a funky beat. The gallery employees work the ironing boards, sipping on sodas instead of trendy cocktails. The exposed-beam ceilings and crisp, oxford-white walls serve as a canvas for the ever-growing cacophony of artwork, patch-worked above the industrial dryers and glowing under the fluorescent bulbs. 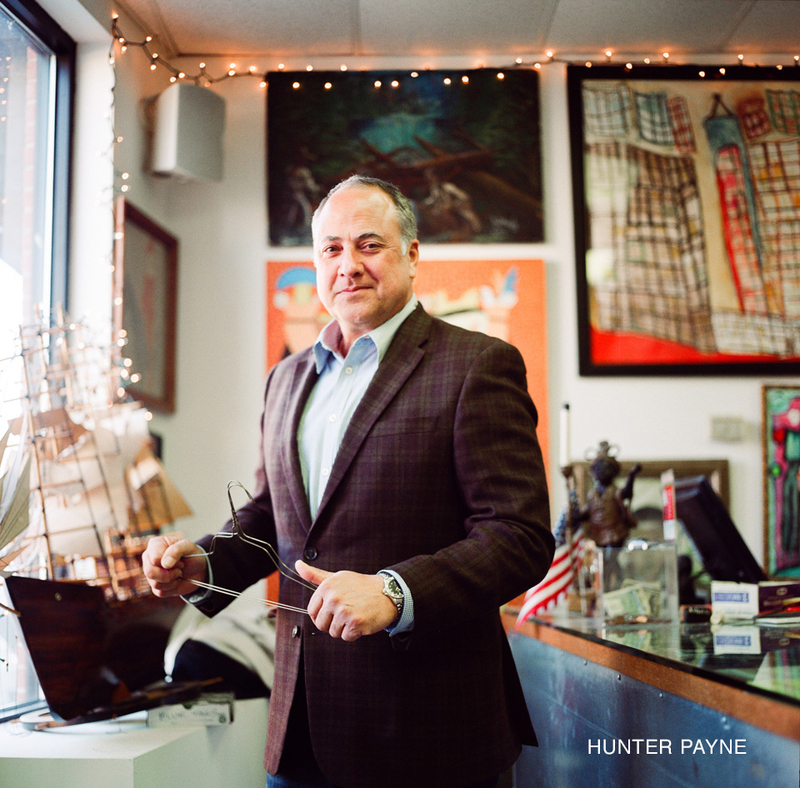 In a space within the building typically reserved for twist ties and hangers as VIPs, Payne has let the artwork be the star in this otherwise utilitarian locale. Even here, in the bowels of the dry cleaners, no wall space is wasted, no usable surface untouched by color and wonderful curiosities, as we can tell as our eyes wander from the mounted ram’s head to the velvet Jesus keeping watch over the rotating racks.